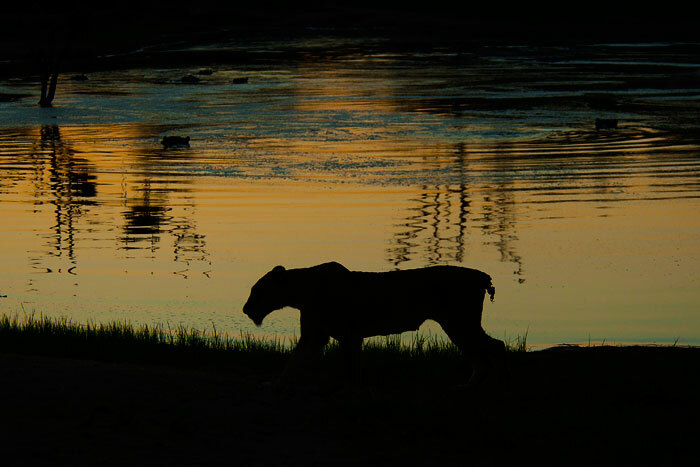 The 'New' Tailless Tsalala lioness walks past Taylor's Dam just after sunset, while the hippos watch. She seems to be coping with her hyena-inflicted injury quite well, as she is keeping up with the pride, although slightly thinner than the others. We hope she will continue on the road to recovery. 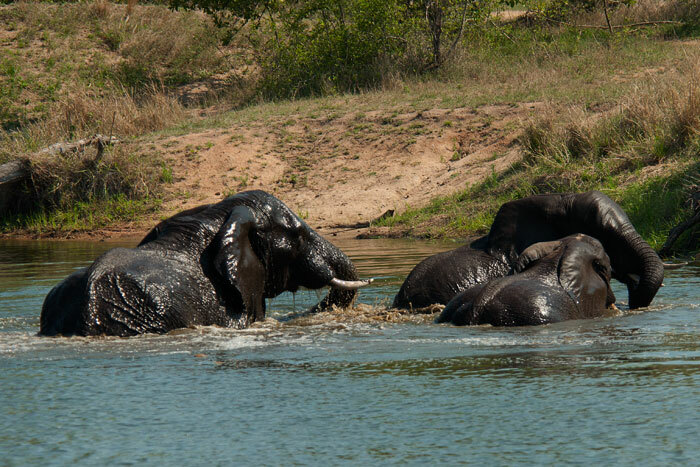 It's not just the guests who jump into the water to cool off at Lonolozi... these three young elephant bulls had fun swimming in Ronnie's Dam on a particularly hot day! 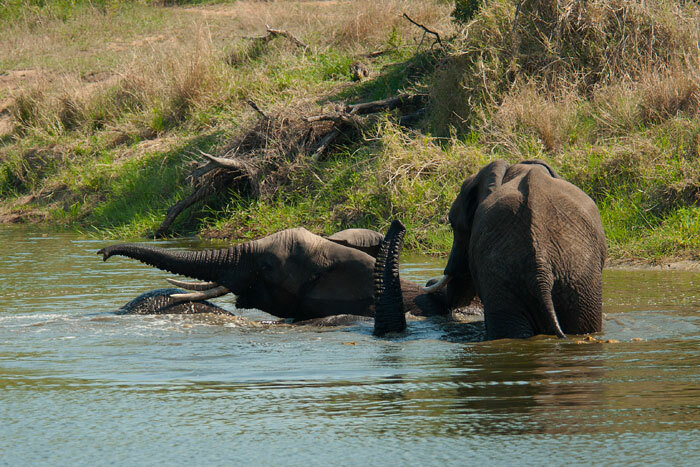 In this area, it is not very common to see elephants actually swimming like this. When completely submerged (like the one in the foreground), they use their trunks as a snorkel, which is very entertaining to watch! They continued playing for a good twenty minutes in the water, the larger of the three clearly showing his dominance! 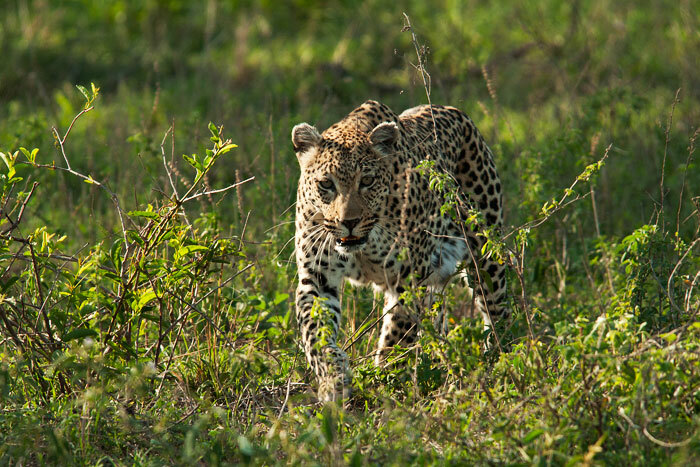 The Maxabene Female struts through the newly green shrubs. In a recent blog post about 'Motherhood in the Bush', Kate Imrie talked about the connections we feel with individual animals, and for me, Maxabene is the one! 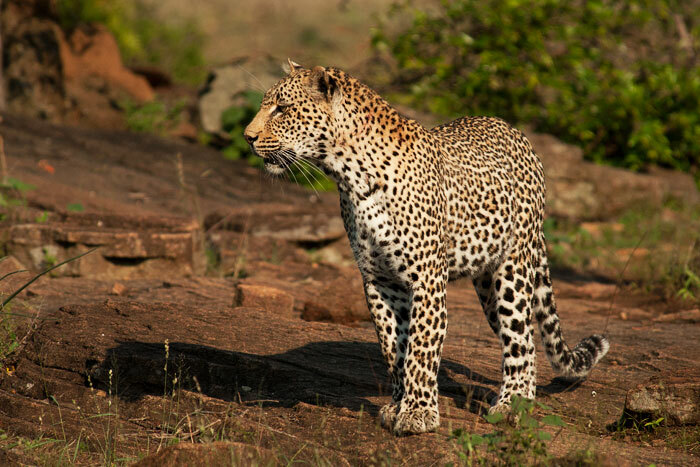 The smallest of the female leopards at Londolozi, as a young cub she was separated from her mother in a run-in with hyenas, and the rangers at the time thought she'd never survive. 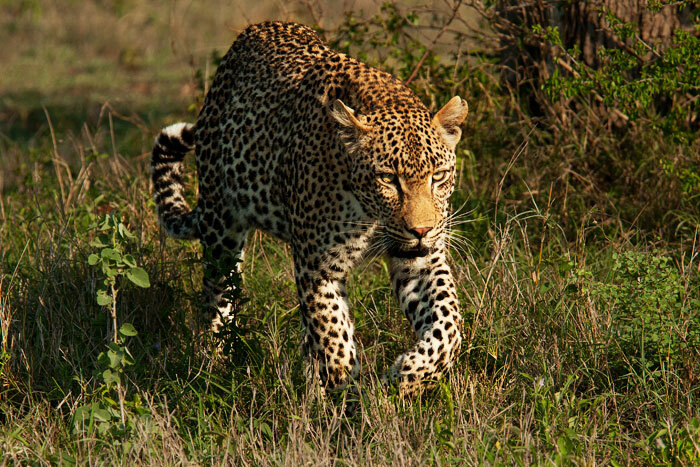 But this tough leopard somehow managed to fend for herself and is still going strong thirteen years later. She stalked a herd of impala for a while, displaying her patience as she waited next to our vehicle for about fifteen minutes watching their movements. Unfortunately, some wildebeest behind her saw her and sounded an alarm, alerting the impala to her presence. Irritatedly she started rasping when she realized she'd been spotted, and walked straight by the herd of impala with her tail in the air. It is difficult to see in the photo because of the long grass, but her belly was swollen and she was definitely lactating. This means she is either very pregnant, or has small cubs at a densite in an unknown location. Very exciting news! 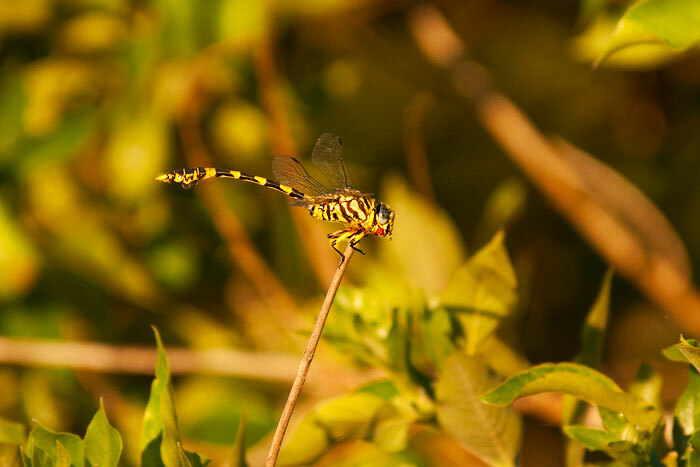 A dragonfly catches the afternoon light by the Sand River. The Scar-nosed Majingalane Male looks up at some vultures circling in the sky, a possible cue that their is meat to be had underneath. 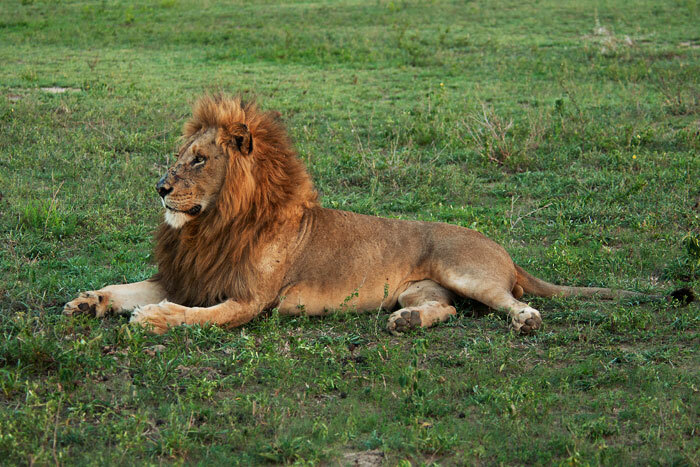 Fearless hunters, these males are more than capable of making their own kills, and do so often. However, they are not shy of trying to score a 'free' meal from the other predators in the area, or scavenging. The Coalition was present on Londolozi for most of this week, often seen with the Sparta Pride, and heard roaring throughout the nights. 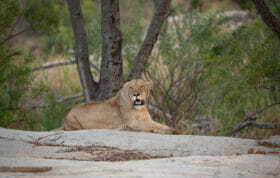 The Maxabene 3:3 Young Male was also seen a few times this week. 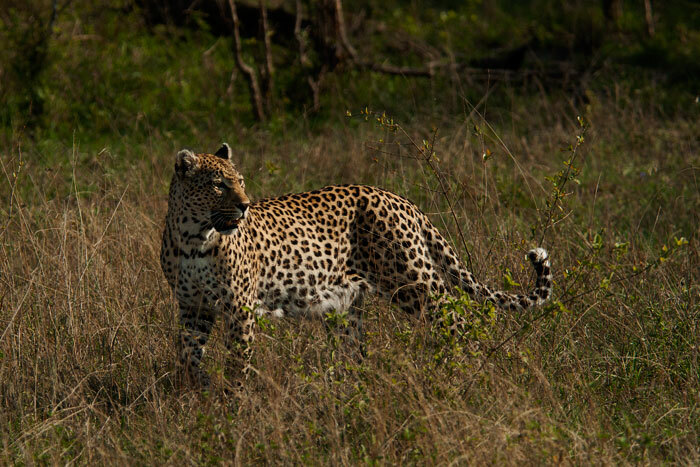 He has been occupying an area on Londolozi with a very open landscape: not your typical leopard territory. Perhaps, however, he is clever to adapt to this instead of fighting with the many other males for a more customary habitat. 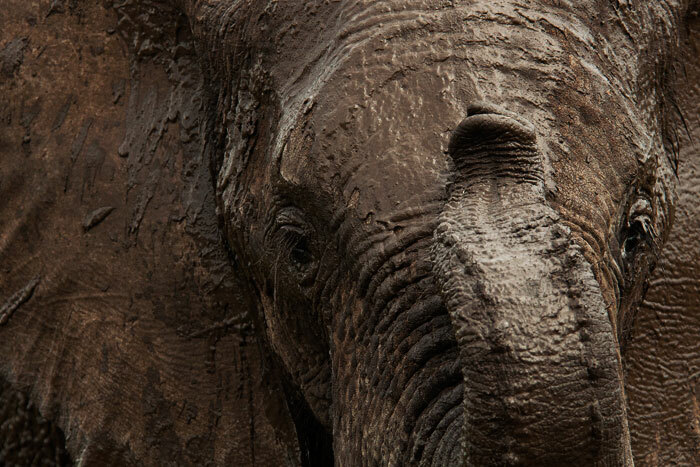 A young elephant bull smells us curiously after having a mud bath. A second elephant bull passes by after playing in the mud. They use their tusks sometimes to dig at the sides of the mud wallows, loosening the mud to roll against the banks. 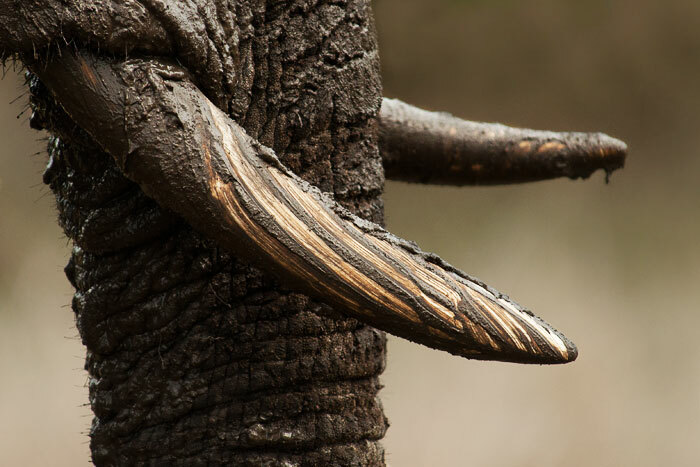 With all the focus on rhino poaching in Southern Africa, we tend to forget that elephants are also targets of poachers, for their ivory tusks. Unfortunately over the past year there has been a huge surge in elephant poaching, particularly in East and Central Africa. Although their numbers are more stable than rhinos, we should still be greatly concerned about this recent increase in the black market demand for ivory. One of the Majingalane Males uncomfortably lies on a fully belly after feeding on a nearby buffalo carcass. It was difficult to tell what exactly had happened, but through looking at the tracks Freddy guessed that the female buffalo had been killed by other lions (most likely the four Tsalala lionesses) who had then either been chased off by a clan of hyenas, or gone for some water while a clan came in and ate most of the carcass. It seems the big male was able to chase the hyenas off, however. 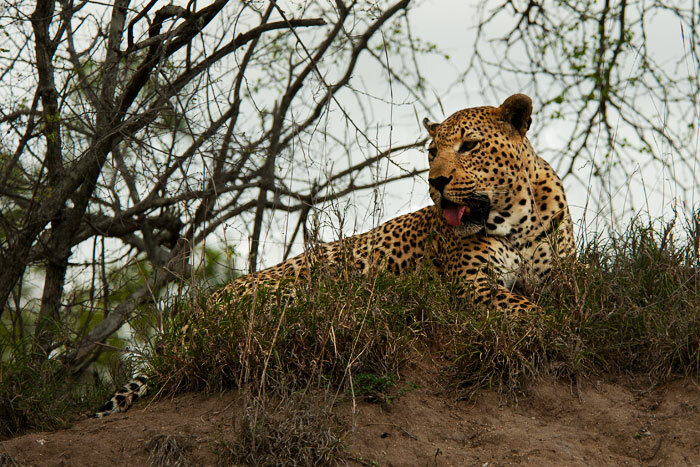 The Camp Pan Male sits panting atop a termite mound. He was very full from a recent feeding, and also very hot on this muggy morning. Nicknamed 'Chinese lanterns', the sicklebush flowers came out this week. 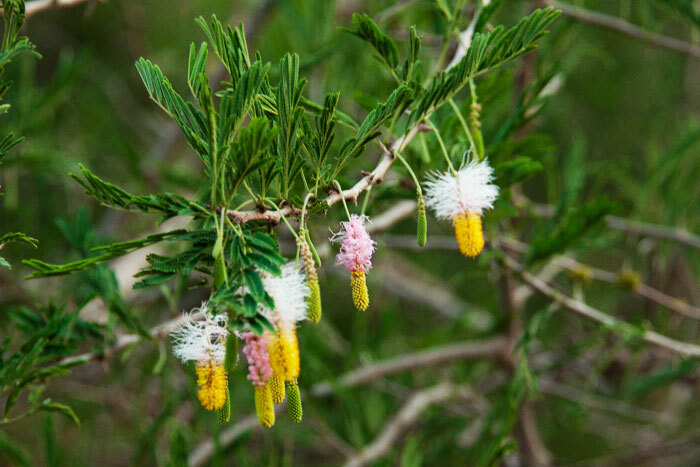 Although this thorny bush looks like an Acacia, it is of a different family and of less nutritional interest, is seems, to many of the browsers we see at Londolozi. Out here in the bush, we learn something new every day. This was the start of an interesting interaction between a hyena and the Nyeleti 4:3 Young Male Leopard. 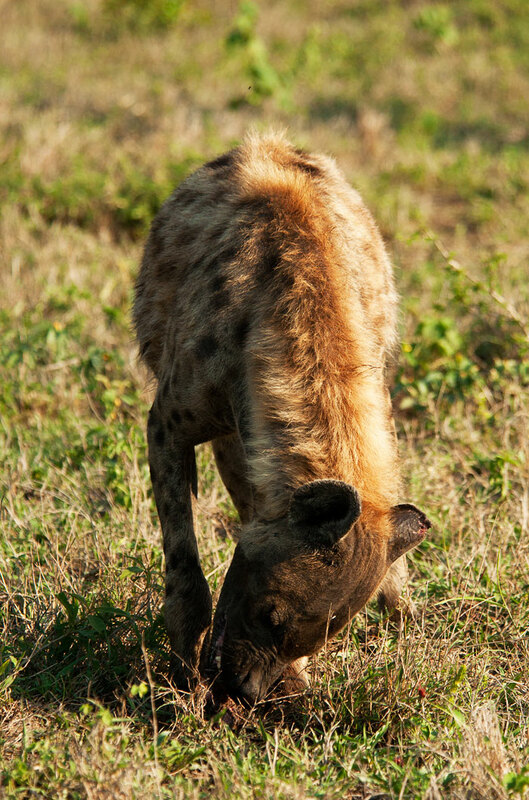 We first spotted a drag mark of a carcass on the road, which lead to this hyena munching on what we thought was the only remainder: some small bones. 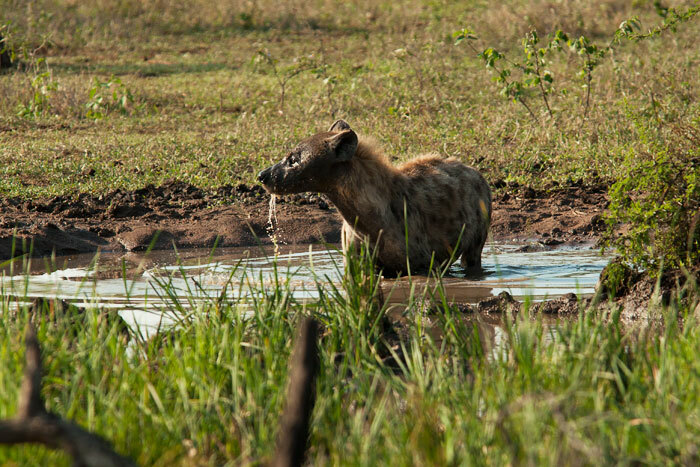 Nearby, the Nyeleti Young Male lay, slightly full, panting in the shade, staring at the hyena. Clearly, he had had his kill stolen by this hyena. As the hyena moved off, the Nyeleti youngster came towards us, interested to see where the hyena was going. There are no hard and fast rules when it comes to interaction between different species and you can never really predict what is going to happen, particularly when predators come across one another like this. The leopard seemed less interested in having an aggressive encounter with the hyena than simple curiosity. 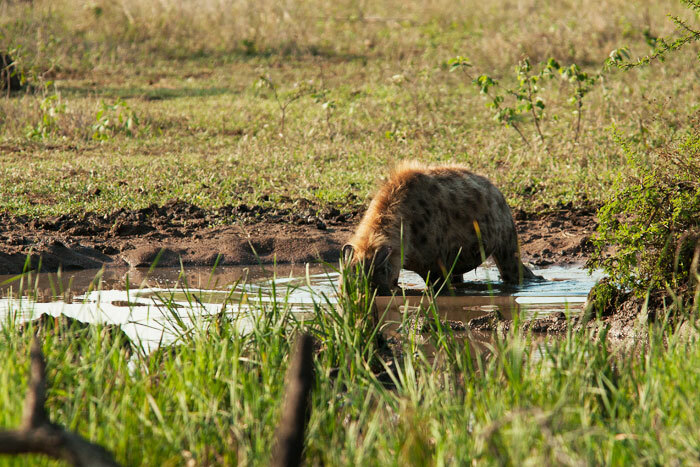 Then the hyena waded into the nearby pond, submerging her head. This was quite strange for an animal that doesn't normally swim or inhabit aquatic areas. Even the leopard seemed to think this was strange behaviour, watching the hyena from across the pond. Every now and then, the hyena would pick her head up and look around, perhaps watching out for the leopard and other predators. It was clear she was looking for something beneath the surface of the water. Finally she found her prize: the remains of an impala which she pulled out of the pond and dragged into the bushes. Another quick look at the tracks confirmed that upon stealing the kill from the leopard, she had dragged it to the water to stash it while eating small pieces, presumably thinking it unlikely for the leopard or other predators to 'swim' in search of a meal. Freddy says he has seen this behaviour once before in hyena. Apparently accepting that the hyena's trick had worked, the Nyeleti Young Male then walked past the pond and lay down in the shade to groom before taking a nap. It would be interesting to know if he also learned something from watching this? 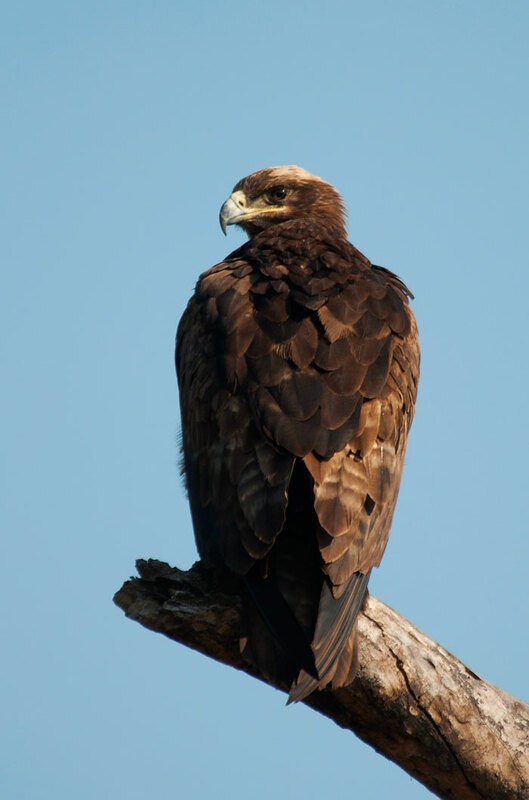 A Steppe eagle sits and watches for prey below. This eagle looks very similar to a Tawny eagle, but the diagnostic difference being the very large gape: as you can see here the corner of the mouth is in line with the back of the eye, whereas in the Tawny it only extends to be in line with the pupil. 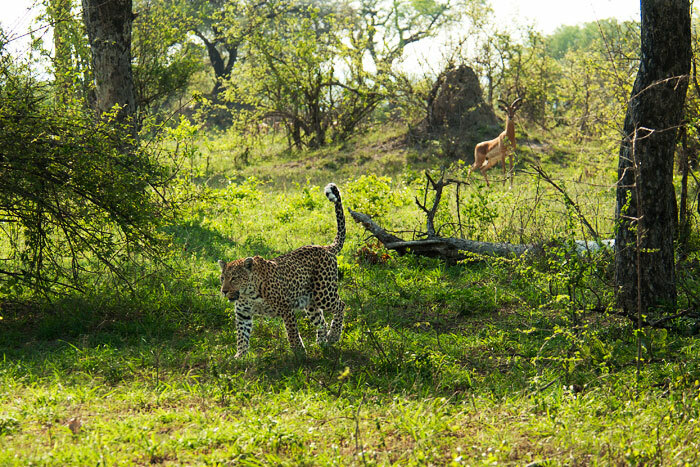 We are very happy to have these migrants back at Londolozi! 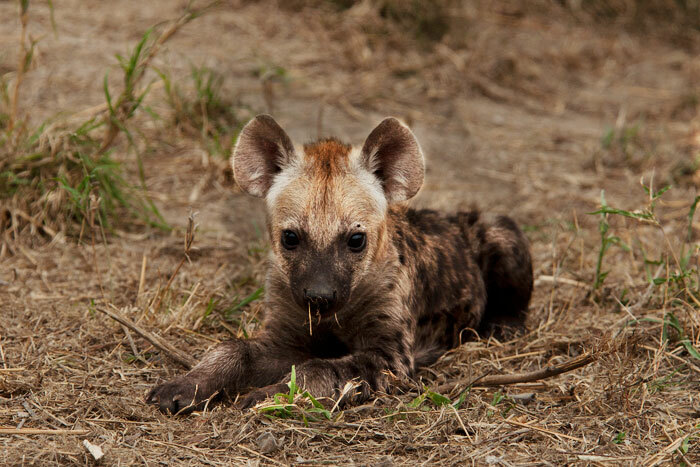 The week finished off with a fantastic sighting at the hyena den site. The den site had almost been declared inactive, since there has been no sign of the animals in the past 2 weeks. However we thought we'd take a chance and check it out, which paid off! They are getting bigger, developing the faint spots in their coats and also displaying significantly more confidence, coming straight up to the vehicle. There seems to be two sets of two siblings each that are roughly the same age. 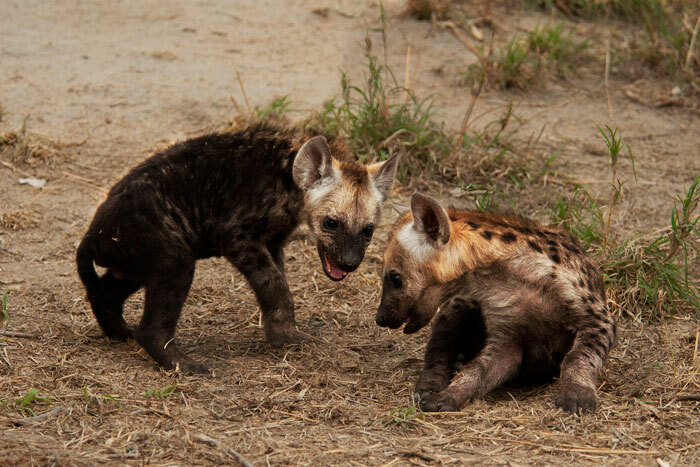 Hyenas are known for being fiercely competitive with their siblings, but the snarl here was just in play. I'm really looking forward to watching the progression in their lives as they grow. They do need to continue to be careful, but luckily they seem to have a watchful mother. 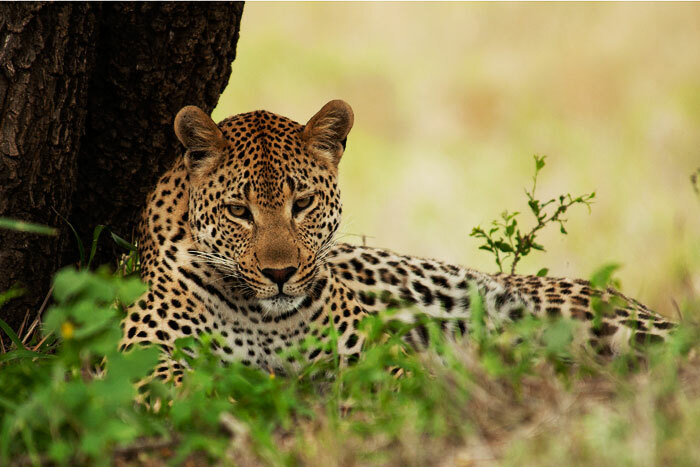 The densite is in an area commonly used by several different leopards in their territorial patrols. Indeed, shortly after this photo was taken, all the cubs rushed into the burrow as the mother leapt up, looking in the direction of impala alarming. 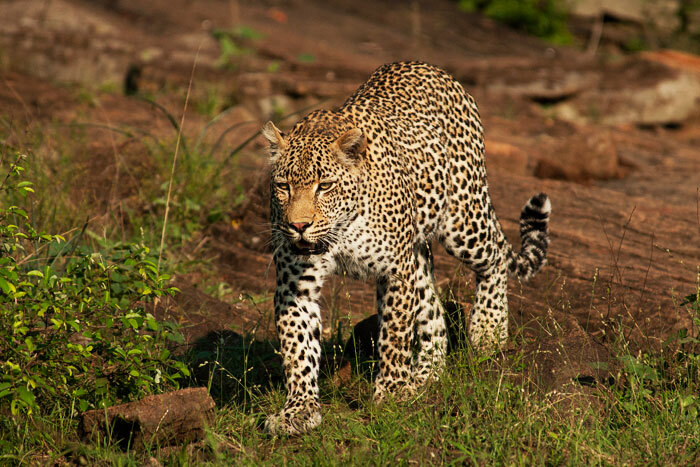 It was the Vomba Young Female leopard, who was luckily more interested in marking her territory than targeting the young hyenas. Fantastic! what a wonderful week. Each encounter seems simply breathtaking. I love the Chinese lanterns blooming – The Sickle Bush is a most fascinating tree, with the most remarkable adaptations and uses. Thanks Penny! I’m hoping to get some better photographs of the Chinese lanterns as well as other flowers in the weeks to come! endless knowledge – and we love it !!! Thank you Sheena 🙂 We are simply far too lucky to be seeing all this out here, so I feel it’s only fair to share as best we can! Thank you Talley for another set of incredible photos. The first one of the lioness is remarkable. I’m hopeful for her too. Thanks Sandy. I’m actually not at Londolozi at the moment, but have been keeping tabs on her and as far as I understand she is getting better every day. 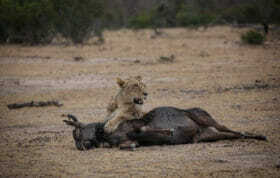 Definately not the ‘scavangers’ people believe them to be… I do believe lion take their kills quite often. Thanks Jeanne, I also hope they’ll leave the lions alone when they get older! You are absolutely right they are remarkable hunters, and I anticipate they will be hunting lots in the coming weeks with the newborn impala and other antelope around. Yay! I knew they couldn’t have left us!! Thanks to you Sheila for reading!! Hmmm…just to let you know, I clicked on ‘Subscribe Now’ in the top right-hand corner of your page and it brought me to an XML file. No need to post this comment, it was just to let you know! and Rod were the perfect hosts – we each had our own villa!!! Just fab!! I hope to return next year with more “onions” in tow. Great pics 🙂 Just looked through the whole site with Adam and Richard (the Londolozi blogging team) here at Gorongosa National Park, Mozambique. Gorongosa is inspired!! Also, thanks to the guys for the practice game drive sundowner and gin tonicas on the famous lion house with our local guides. CHEERS!!! Corina, I’m thrilled to hear that Ad and Rich are not only spreading joy through the blog but also though gin and tonics. The rest of us will be there next year! 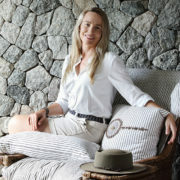 Corina it was wonderful being at Gorongosa… we are the ones that are inspired. Truly wonderful. 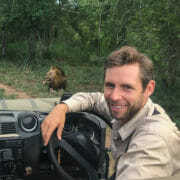 Privileged being at one of Africa’s wildest spots! 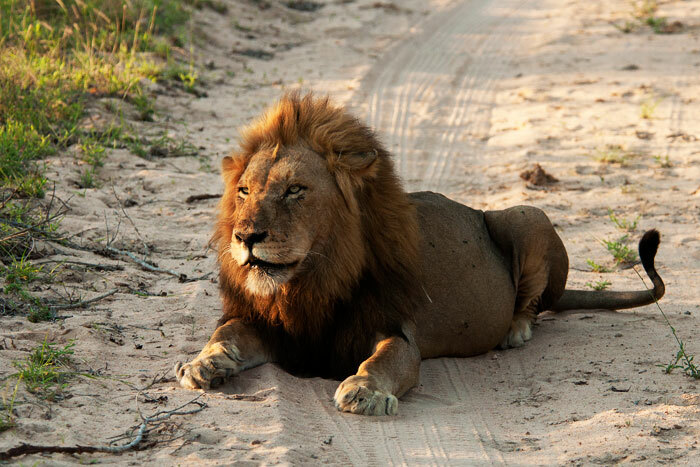 For those of you who have not come to Gorongosa…you must go…it is MAGIC!!! Have any of you been ? Thanks Verney, I also find myself in awe every day at how much happens every day right before our eyes. The African bushveld is a magical place!